Project Appraisal Excel Template - ANALYSISTABS - Innovating Awesome Tools for Data Analysis! 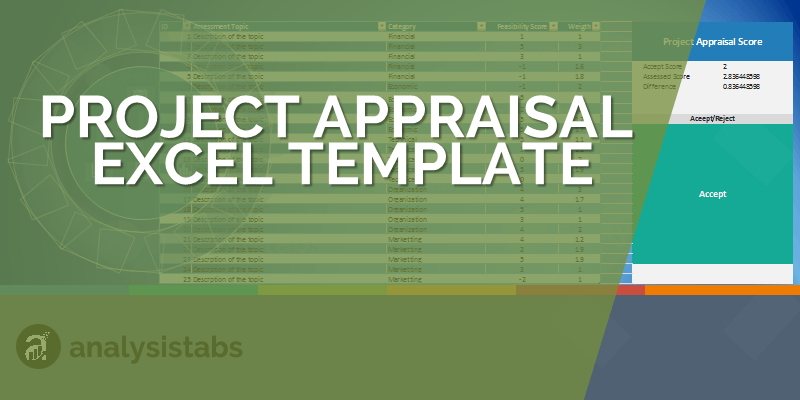 Here is a Free Project Appraisal Excel Template. You can download the template using the below link. This Project Appraisal Excel Template works in Microsoft Excel 2007,2010,2013,2016 and above. In this Project Appraisal Excel Template, you can go to the second sheet to see the template. The first sheet of the template contains the brief information about the Project Appraisal Template. And the second sheet is the actual spreadsheet to capture your data. Also, you can capture the topics with appraisal techniques and methods. The Fourth Column (Feasibility Score) you can enter the number between -5 and 5. And the Weight is important factor of the assessment topic. On the right-hand side, you can see the overall Project Appraisal Score, and you can enter the minimum acceptance score to decide to accept/reject the project proposal.